It started my interest in conversations. A manifesto that seemed right for the frothy age I finished University. I can hardly believe that it was ten years ago today that I read a little article in The Guardian by Jack Schofield, while I was reading the newspapers as part of my student job in a British PR agency. The article that captured my attention was about a website that was to turn into a little book. A “primer on Internet marketing”, according to Schofield. It was called The Cluetrain Manifesto. Some months later, I bought the book on Amazon, the “will-it-won’t-it-make-a-profit” online book seller. Jeff Bezos was one of the best-known men in business, and great excitement followed him around. But great excitement also followed around the founders of the doomed Boo.com at that time, so that didn’t mean much. So, the book talked about conversations between people, and about the way companies were not going to be in the conversation for long if they didn’t start talking like people. In conversations. Oh, there was a lot more. A lot of “we don’t know”. Some detail about some ways conversations might manifest themselves, certainly the flavour of what a conversation between people feels like. Plus there was a cool petition-type-thing on the webpage (I just checked – it’s still there) with a lot of names of people I’d never heard of (I’ve heard of a lot of them now, funnily enough). But in essence that was it. I found it mind-blowing. Difficult to comprehend, and slightly complex – but it also felt deeply right. Fast forward ten years to Cluetrain 2009. I just read the Manifesto again yesterday and I had two main thoughts. First – wow, it was so *right*. I mean, I can’t really see a thesis that hasn’t either become self-evident, or is on course to become so. And second – it seems so simple now. Maybe I got cleverer. But perhaps visionary ideas always seem difficult to comprehend when you are WAY ahead of your time. Ten years in Internet years is a lifetime. Or two. Moving on then, what else changed apart from me? Jeff Bezos is still the man, but this time it’s of a “will-it-won’t-it-make-$1bn” online retailer, digital reading device maker and crowdsourcing engine. I now follow @jackschofield on Twitter (as well as @dsearls). And a friend of mine, Will, works for Venda, which bought the technology of failed Boo.com. Venda makes a profit, just like Amazon, which proves lots of lessons have been learned. But there are still more to learn. UPDATE 16 April 2009: Jack Schofield brilliantly tweeted the names of the other Cluetrain authors last night – so now I’m also following @clockerb @dweinberger and @ricklevine – thanks @jackschofield! You have to give it to the people who have put this together – they have achieved an April Fool’s trick to rival the best of them. 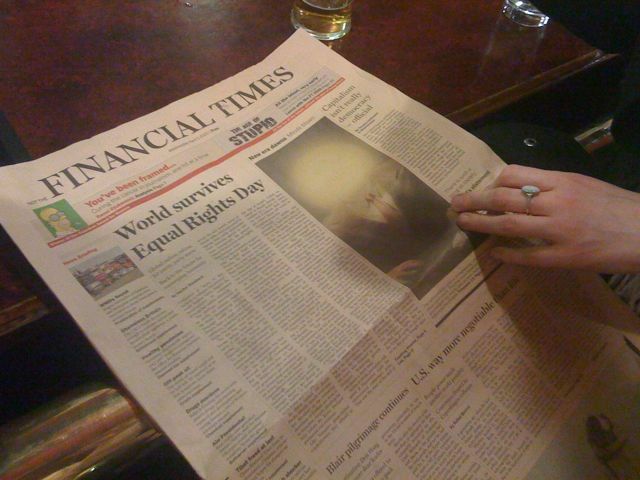 Entitled “not the Financial Times”, and dated 1 April, it looks at first glance to be the real pink paper. It seems to be on the right newsprint, and the typeface has been aped brilliantly – though not perfectly. But the editorial is irreverent, and in places downright offensive. And there is no doubting the target of the derision – big business and Government. Welcome to anti-G20 week. Look out for similar devices in the week to come. You are currently browsing the archives for the PR category.